The tunic stitch is another one of those real easy patterns that looks more difficult than it is. It's a strikingly beautiful pattern. Although both sides are not the same, they are both attractive so you can use either side. The picture below is of the right side. Here's how to knit the tunic stitch. Row 2: K all the stitches across the row to the end. 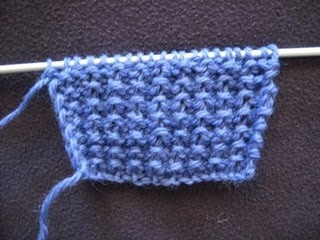 Video demonstration of knitting the tunic stitch. Yea, a new stitch now learned! I have never seen this stitch! I can't wait to try it.